An obscure company conducting scientific experiments related to genetic manipulation on animals on a space station, get the horrible news something terrible has gone wrong. Then you see one of the female crew members getting away by means of an emergency capsule, while a terribly mutated rat is chasing her. And yes. She managed to secure some canisters with samples of the genetic material. Until the emergency capsule explodes and the samples end up on the earth. The result is a trio of random animals that bump into the canisters by accident and inhale a strange looking green smoke. And that is when trouble starts. The result is Chicago being reduced to rubble by the three cooperating giant monsters. Chased by the military and getting nuts due to some kind of radio signal that the obscure company broadcasts so they can regain the genetic material, the three primates leave a trail of destruction behind them. It all sounds pretty bizarre and ridiculous. “Rampage” isn’t meant to be taken seriously and you should watch it with your mind turned off. But boy, what a joy to watch it as soon as hell breaks loose. Occasionally I like to watch such a pulp film. You can look at it as a mixture of “San Andreas” with “Godzilla” and a King Kong movie. And who to ask best to play the leading role in such a film? Exactly. Dwayne Johnson. Not exactly an actor who you’d associate with high-quality films. But since “Jumanji: Welcome to the jungle” I appreciate this guy and realize that he has more qualities than just inflated biceps and an impressive chest. Perhaps his acting is sometimes terribly exaggerated and it’s filled with some bad jokes. But I admit that it’s a pleasure to see the man at work. The enthusiasm and his empathy are phenomenal. I want a George as a pet. However, the one who steals the show is the albino monkey, George. A computerized, motion-captured character who’ll charm you from the start and guarantees some funny moments. It’s a gorilla who masters sign language and who has a weird sense of humor. George fits perfectly with the rest of the film. It’s utterly ridiculous and sheer nonsense packed in a destructive and action-rich whole. The supporting actors were already standing in George’s shadow. But as this monkey starts to grow into something enormous and begins to slam things around, those supporting actors are really tiny, so to speak. The clash between the oversized George and the mutated alligator is brilliant and a joy to watch. It reminded me of those old monster movie like “King Kong v. Godzilla “. A clash between two titans in the city of Chicago. A city turned into a battlefield with those two creatures creating havoc. 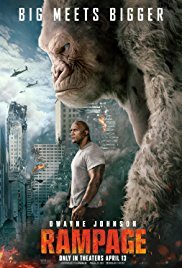 “Rampage” is a fun movie full of nonsense. “Rampage” is no more than an exorbitant disaster film, full of spectacle and sometimes enjoyable humor. The film is overloaded with improbabilities, you don’t pay attention to after a while because you automatically shift into a sort of nonsense mood. I still don’t understand why this multinational didn’t use a remote facility with heavy surveillance to perform these genetic experiments. And why lure those huge, destructive creatures towards you? When an arsenal of military missiles doesn’t even cause a scratch, how were they going to get the genetic material? But again, don’t pay attention to that so you can enjoy this blockbuster, full of graphic wizardry and spectacle. It’s certainly worth it.